As an editor, writer, web designer, and developer, being a good communicator is a must-have skill for me. While it certainly is a boon to my job that I have strong English skills, that&apos;s often not enough. That&apos;s why there are tons of screen capture tools available on both Mac and Windows that allow people like me to express ideas, concepts, and problems in a visual way. After all, it&apos;s a pretty well established fact that many people understand things better with visuals instead of words alone. In this post, I&apos;m going to introduce you to a screen capture tool that I wish I&apos;d been introduced to a long time ago: It&apos;s called CloudApp and I&apos;ll show you how it can be used to communicate bugs, features, and workflow steps that come up in a typical developer workday. How Can Developers Use CloudApp? In a nutshell, CloudApp is a visual communication platform with a ridiculously easy-to-use interface that allows you to create, save, and share annotated screenshots, animated GIFs, and screen recordings remotely. Need to point to a specific feature in an app or on a website? Want to describe a step-by-step process? Need to highlight where a piece of content can be found on a page, while blurring out sensitive information? Or maybe you just need to explain a layout bug in a visual way. The features of CloudApp make accomplishing these tasks as quick and painless as possible. CloudApp can be downloaded and installed natively on Mac or Windows, and can be integrated with a number of well-known tools including Trello, Zendesk, Slack, and Google Docs. It&apos;s similar on Windows, placed conveniently in your system tray. I&apos;m almost ashamed to admit what my current setup is for doing screen shots and recordings to provide feedback, answer questions, and issue bug reports to clients, co-workers, and others. I use a native app for screenshots, another one for annotated images, a large bloated piece of software for screen recording, and a couple of different utilities for doing animated GIFs. I&apos;ve also used a few web-based apps for some of these tasks. None of the aforementioned tools is overly complicated, and they all do an adequate job, but it&apos;s not ideal to have to open a different app for each of those tasks. Enter CloudApp, which does all of this and more in a single, powerful, and easy-to-use tool. As you can see, there are quite a few features packed into a smart and clean interface. You can try to do those things with words alone, or with static, unedited images. But what if you could accomplish those tasks in a speedy, productive manner using animated GIFs, screencasts, and annotated images? Let&apos;s consider the three things just mentioned and how CloudApp makes them easier. As a developer you&apos;ve probably had the "that&apos;s not what I see" experience when dealing with how a design looks or how a certain feature works (or doesn&apos;t work) in a particular browser. The client (or maybe someone else on your team) sees a bug that you don&apos;t see. Or maybe it&apos;s the other way around. Whatever the case, being able to quickly create a screenshot and annotate it is a huge time saver. In this case, I&apos;ve taken a screenshot of the search box on scotch.io on Safari 10 for desktop, so I can point out an alignment problem with the magnifying glass that appears inside the box. As many developers have discovered, Safari is the new IE in terms of bugs and incompatibilities. So a tool like CloudApp can come in handy when doing testing on Safari. Once you hit "save" in the annotation window, the link is copied to the clipboard and you&apos;re ready to share the URL and get feedback. In fact, for every piece of content that gets created or added to CloudApp, you automatically get a URL that uses the &apos;cl.ly&apos; link shortener copied to your clipboard, which you can then share with anyone. Let&apos;s look at another handy way to use CloudApp. One thing that I&apos;ve often had to do in my work is explain a feature in an app&apos;s interface, maybe something not so easy to find. As an example, let&apos;s use the Chrome DevTools and let&apos;s say I had to describe to my QA team how to test certain parts of a web page with pseudo-states enabled or disabled. Of course, they could do this by simply using a page as a typical user would, but there could be an edge case where doing this via the DevTools can speed things up. Notice the right sidebar area that allows for comments. This allows me to send a screenshot, GIF, or video to a colleague and they can add their questions, feedback, etc. Much more useful and productive than a run-of-the-mill screen grab tool! As a developer, you probably love to share your productivity and workflow tips with others. Or maybe you just want to show a series of complex steps in a single recording without the need to take multiple, annotated screenshots. CloudApp&apos;s video recording feature is great for this. And once again, as with GIFs and screenshots, the media page for the video allows comments. In this example, I&apos;ve added a comment to explain how I did a "find" inside the script, which might not be obvious when playing the video. That screenshot is annotated with CloudApp, and the annotated file is itself available for comments and feedback from anyone who views the link as a logged-in user of CloudApp. Thus, CloudApp allows me to create a video or GIF demonstrating the command being executed along with the result in the terminal. The person I send the link to can now run the same command and compare the results, ensuring there are no mysterious error messages or other problems. I&apos;m sure you can see great benefit to this, especially when you&apos;re dealing with much more complex workflows and terminal commands. This sort of thing can also be a great benefit when doing presentations. So whether you&apos;re presenting something in a meeting at work or at a conference or local meetup, CloudApp becomes your one-stop app for creating all your screenshots and animated GIFs. I have to admit, I&apos;m really impressed with the UI for CloudApp. There is no clutter and somehow the CloudApp team has been able to include so many extra features that I haven&apos;t even discussed here. It&apos;s actually been a pleasure examining and learning all the ins and outs of the app while putting together this article. Access to "My CloudApp", a web dashboard where you can search, sort, and organize your media. Ability to "drop" just about any kind of file into CloudApp, all of which becomes part of "My CloudApp", allowing you to share, organize, sort, etc. Access to analytics for all your "drops", including file history, number of views, and more. Ability to drag a file directly onto the CloudApp icon in the menu bar for an instant "drop". As the examples in this article have demonstrated, there&apos;s a ton of stuff you can do with CloudApp to help you improve communication on your team and with your clients. 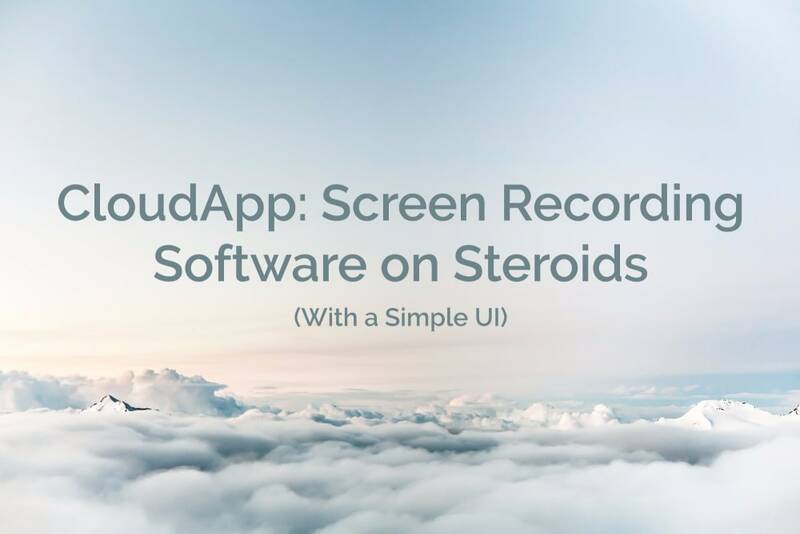 CloudApp truly is screenshot software on steroids, and as easy to use as the simplest of screenshot tools. CloudApp&apos;s free plan is used by millions and there&apos;s also multiple individual and team paid plans that you can upgrade to that offer more features including security, custom branding, and more. I highly recommend you at least try it out and fiddle with the different features I&apos;ve discussed here. I&apos;m sure after just a few hours of use you&apos;ll consider adding it to your team&apos;s productivity and communication toolset. Louis Lazaris is freelance web developer, and author of two books on HTML/CSS.